commercial and industrial facilities. These units are ideal for both new and retrofit applications where performance cannot be compromised. 25 - 300kA per mode, maximum single impulse ratings. All modes protection L-N, L-G, N-G, L-L. "weak link" eliminated - entire SPD surge path tested to ratings. Robust MOV Technology; Industrial grade 40-48MM MOVs. No "stacked" ratings of small electronic grade MOV arrays. 25 - 200kA per mode devices use (1 to 4) MOVs per mode. 250 - 300kA devices - (3 to 6) 40-48MM MOVs per mode. 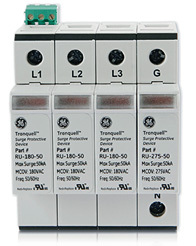 TR 7000 Series - 20,000 ANSI/IEEE Category C3 Impulses repetitive surges. TR 5000 Series - Up to 5,000 ANSI/IEEE Category C3 impulses repetitive surges. 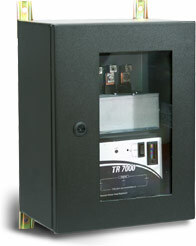 TR 7000 & 5000 Series - 5,000 ANSI/IEEE 500V, 2kA 10x1000micro sec. longwave repetitive surges. Suppressed Voltage Ratings (SVR) for all levels of electrial distribution system including service entrance, distribution and point of use locations. Smaller size and weight makes easier installation in tight electrical rooms. optional fiberglass on NEMA 4X design. Link to our literature page for additional spec sheets and guide specs. The full-featured Tranquell™ DIN Rail Mount SPD (Surge Protective Device) is a Type 2 surge protective device that is modular and easy to install. DIN Rail mount housing allows for quick installation. Each unit has a compact footprint and user-replaceable phase surge pluggable modules with an IP20 finger-safe design. Both visual indicators and remote indicators (dry contact) provide SPD status to critical control circuits.